If you’re a frequent visitor to my blog and website, you’ll now notice that it’s under a new domain, and has a fresher, more modern look. Rest assured, this is still the same site and blog as Meta-Earth.com, but I’ve decided to transfer my site to a domain bearing my name for… I guess… the vanity of it? But in all honesty, the old domain name does not have a lot of meaning behind it, and “Meta-Earth.com” was just hard to rattle off to people, as I always had to literally spell it out letter-by-letter, along with the hyphen. So, yeah. A new domain name it is. Welcome to MWChase.com! 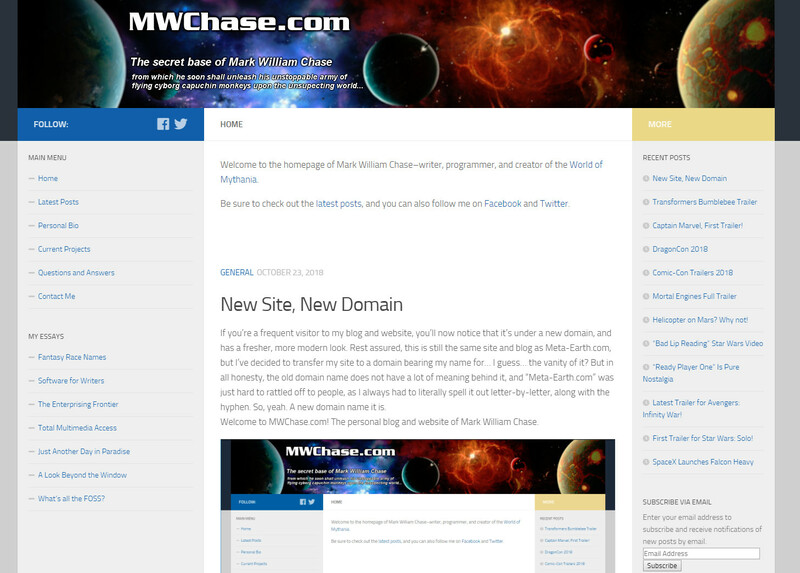 The personal blog and website of Mark William Chase.